This however, can be applied to any color as well, and can alter moods and perceptions of neighboring colors. Value is an incredibly useful design element, and should always be taken into consideration when creating. It can be tough to explain to some folks, but some colors can have the same value. When this happens, it isn’t a good idea to put these two together. Say you wanted to put blue text over top of a red background. 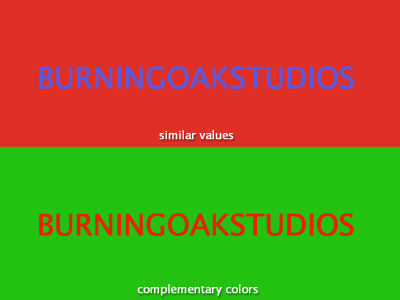 These two colors are quite different, however, since they are of a very similar value, all contrast is lost. It is a similar effect to using complementary colors as text/background combinations (which is rarely a good idea), which at times will make your eyeballs vibrate and possibly fall out of their sockets. Sfumato is basically a value contrast technique. With this technique, there are no violent edges from bright brights meeting up with dark darks. 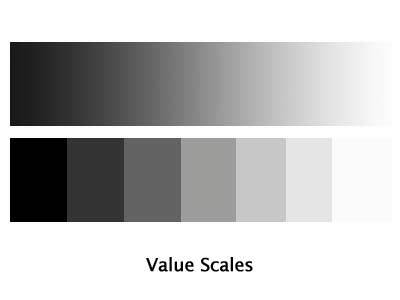 All values have migrated towards the “middle grey” range so there aren’t many high contrast areas. Often times, this will create a more subtle, low contrast image in which there is more of a gradation of colors versus the hard edge contrast of Chiarascuro. Chiarascuro is Italian for “light-dark.” When used in the “art world,” this term refers more specifically to the contrast between lights and darks in a composition. Typically it is used to describe a high contrast in darks to lights or a bold placement of dark next light. This has also come to be recognized as a “graphical” style that is intended to help bring out a focal point and sort of put it in the viewer’s face. Always keep in mind that hard edges and stark contrasts can make or break a design depending on the objective/intentions. Categories: Graphic Design | Tags: chiarascuro, Graphic Design, sfumato, value | Permalink. Been slacking off a little bit in the blogging department. I’ve been a busy-Bradley the past few weeks, and have managed to get far more done in this short amount of time than I ever thought I could before. The annual Art of the Carolinas event is happening now (started yesterday, Nov 12) and the studio was absolutely swamped with work. We were somehow able to meet our deadlines and we even have our booth all setup with banners, viewable DVDs, music, etc. I was recently presented with the opportunity to play music at Art of the Carolinas, and I of course accepted. I played this afternoon from 12:00 – 2:00 and will be playing those same hours tomorrow and Sunday :). So if you are around, please drop by, check out the Burning Oak Studios booth and enjoy some live music and the wonderful Art trade show. The dates for the show are Friday, Saturday and Sunday, November 13, 14, and 15, 2009. The workshops begin on Thursday, November 12, 2009. It will again take place at the Hilton North Raleigh, 3415 Wake Forest Road, Raleigh, NC 27609. Categories: Graphic Design, Music | Tags: art of the carolinas, Graphic Design, raleigh, studio music for artists | Permalink. P.S. I recently completed a track called “Balance Beam” which is something I wrote lyrics for many years ago, and the music came from about 2 years ago. It is also up on my MySpace page so check that one out if you get the chance. Categories: Graphic Design, Music | Tags: Graphic Design, jazz, Music, recording | Permalink.